Evanna Lynch is living the life she used to dream of: this Irish Harry Potter fan gets a role as Luna Lovegood in her favorite series. She was chosen out of 15,000 contenders who joined the audition for the part of the kooky Ravenclaw. Her audition drove producer David Heyman to say, “Many people can play Luna, but Evanna Lynch is Luna Lovegood.” Although she was without previous acting experience prior to joining the Potter cast for the first time in Order Of The Phoenix, the 19-year-old doesn’t really need to pick her character’s brain. After all, Lynch is the resident Potter expert on set. (laughs) Lady Gaga has nothing on Luna! That’s very true. Well, if she met Lady Gaga, what would she say to her? Would she say, “I was here first”? She wouldn’t… nothing shocks her, you know. Some people are like, “what are you wearing?” Luna would admire it. She’d be interested. She’d like diversity in everything. To be honest, I wouldn’t wear her things. Her clothes are fun to wear but I would feel too much looked at. But Luna is not doing it to make a fashion statement. She thinks radishes look nice on earrings so she’ll wear them. So I wonder what Lady Gaga would think of her. To be honest, I like Lady Gaga, but I think it’s more of an act. She does it for show business. Luna wouldn’t. That’s just herself. Have you ever met anyone who copies her clothes? No. Luna’s colour scheme is like purple and turquoise and I think it’s just something you have to be really confident wearing, really. Luna’s not over confident; she’s just secure. I think most people my age, they’re either doing it to make a statement, like, “I’m going to be looked at”, or else they don’t care. I would like to be like that but to be honest, I’m a bit shy… I don’t like to be stared at, so much. Luna, Neville and Ginny are leading the resistance at Hogwarts. Can you tell us a bit about that? Did you enjoy that character journey? Yeah, that was really fun. I love how they sort of take over… when Harry comes back, and he and Ron comes into the Room of Requirement, and they’re like, “Oh, look at what they did!” It’s sort of like, um, I can’t remember … boys in a tree house and they have all these sleeping bags and these little statues in it… it’s really exciting. Harry’s the one who’s always taken the initiative. Harry, Ron and Hermione, they’re like… “we have to fight”… but now they’re gone and Luna, Neville and Ginny, they do take over. They realize, they can do something, and what they do is very valuable. All their contribution… so that was nice. It’s not like in the fifth book, where we’re just introducing her. Oh, look that’s Luna, she’s kooky, she’s fun. Luna’s just not in the background. She’s there, she’s helping and she’s fighting. The hero gets the girl. That girl is Ginny Weasley – brave, loyal and resourceful. The actress who plays her is just as special. Bonnie Wright won’t turn 20 until next year on 19 February, but she has definitely attracted plenty of attention. 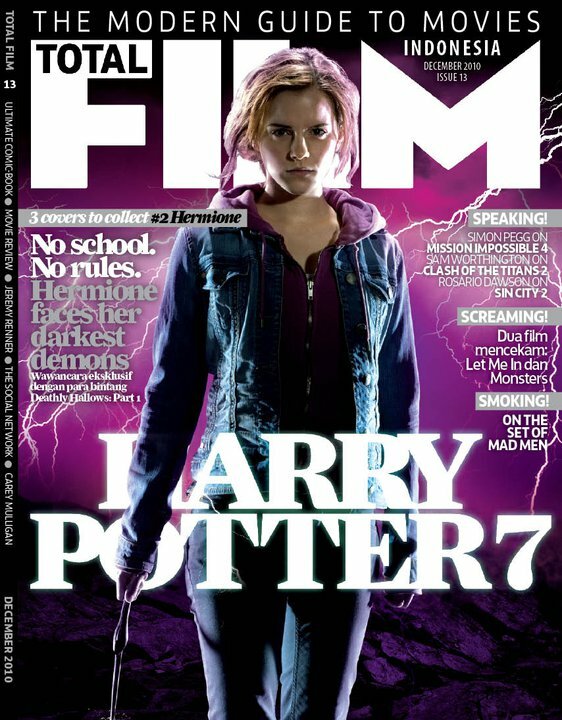 The girl who plays the future Mrs. Harry Potter on screen is stunningly gorgeous. As if the limelight that Potter brought upon her is not enough, she is creating another sensation by dating one of the new Potter actors, who has also worked in Twilight, Jamie Campbell Bower. And the paps are certainly eating their relationship up. Not only that, this tall and thin actress just signed a modeling contract last October with Next Models, which will ensure she will have a post-Potter career. So Ginny, Luna and Neville are leading a resistance against the Death Eaters’ tyranny at Hogwarts. What was that like to play? It clearly takes courage. This is the thing those three characters step up to, beginning in the fifth film, with the Ministry of Magic and Dumbledore’s Army, and they really take on the responsibility. They’re the only ones left continuing this resistance. Obviously Hogwarts becomes a completely different place, it becomes incredibly threatening and stands for everything it didn’t stand for before, such safety, and everything we had there is completely gone. Because we have new headmasters and all these new rules. Are they going to succeed? There’s an amazing scene in the second part, where obviously Harry, Ron and Hermione return to Hogwarts, and the other three have made this kind of hideout and haven, continuing Dumbledore’s Army in their own little way. I think that their dedication is pretty amazing, to keep that going, and I think that’s why people kind of love the three of those characters, really. You’ve shot the Epilogue. Have you gone through an aging process? Yes, it was a very bizarre thing to go through, really, to be able to have that chance to be suddenly made up to look mid-thirties. It’s was an exciting day but bizarre. Obviously, for me, it almost felt like a real cycle, because I started on that same platform, at the same age that Lily Potter, the youngest daughter of Ginny and Harry was, so it’s almost literally like looking back at myself. How does it feel to have three kids? The three kids who played the children were just… they just epitomised all of us, when we were that age, so it was lovely to look back. They were so excited on the day, it was a massive dream come true, and they’d been through such a massive process of auditioning. I think it was probably the most auditions any person has been through to get a part in a film. In the auditioning process Dan and I sat down with different children and talked to them, because obviously the dynamic is incredibly important… to try and portray the idea that they are this family unit, that they’ve spent every living moment together, since they were babies in their hands to how they are now. It was challenging to get that warmth with someone you’ve barely met and some children don’t want to get close to someone they don’t know. But they understood it was incredibly important to make the scene work, so they were very giving to the situation. 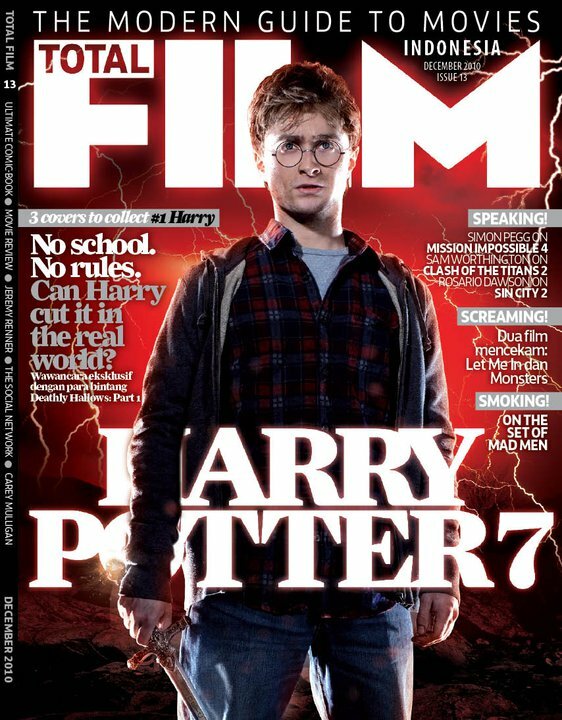 I received my 3 copies of Total Film Indonesia Issue 13, November 2010, from my chief editor today. He was passing by the bookstore and brought me 2 copies of each cover (the extra copy is for our correspondent in the UK) and I opened one to read how the feature was laid out. And as it turned out, it was pretty good. The whole feature is 35 pages. There are about 3 separate articles plus the 8 actor interviews, starting from Bonnie Wright’s and ending with Rupert Grint’s… so it’s like Grint’s is the “big finale”. I remember specifically asking for the interviews to be placed in that order: Wright – Evanna Lynch – Matthew Lewis – James and Oliver Phelps – Daniel Radcliffe – Emma Watson – Tom Felton – Grint. I think it had to do with the number of pictures of the actors we received… or was it the exclusivity of the interview contents? 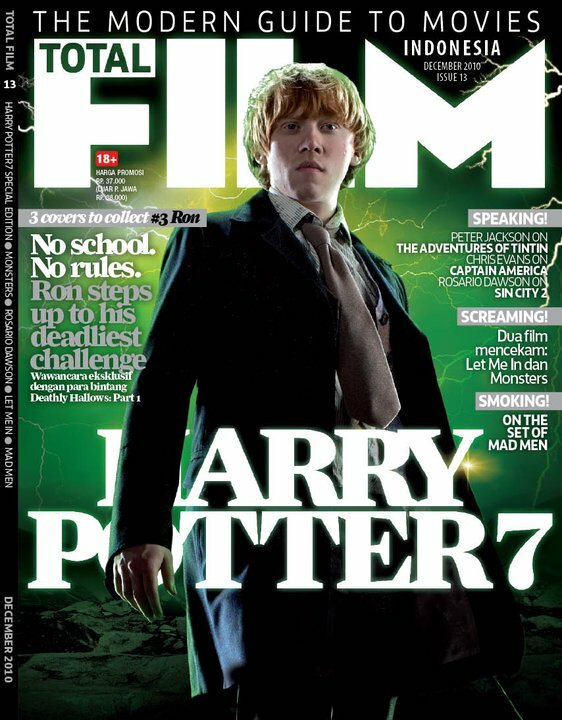 Oh, well, whatever the original reason for putting the layout that way, I feel that it was way deserved because Rupert Grint, in my opinion, showed the best performance in Harry Potter and the Deathly Hallows Part 1. Also, in the article where I laid out 7 reasons to love Harry Potter, I somehow managed to mention Glee in it. As we all know, Glee is my new drug, Kurt Hummel is my new hero, and Chris Colfer is my new favorite eye candy. (And I belong to the minority that think Max Adler’s Dave Karofsky is kind of like Draco Malfoy. In a way. Which makes me uncomfortable but there you go.) I won’t go into too much detail but I did mention Severus Snape as one of the biggest reason to love Harry Potter. I didn’t see the piece I wrote on the upcoming Tintin movie though. Either it will be shifted to the next issue, or I just wasn’t reading closely enough. Abridged Script for this issue is Eat Pray Love. Check that out, as well, although it’s probably not as special as the one I did on The Expendables. Now I have to excuse myself because I need to gather more Narnia 3 information, plan my Deathly Hallows Part 1 review and decide on which movie to Abridge for the next issue. I heard it’s already available in some bookstores/vendors. Check it out! Tom Felton is multi-talented man: he can act, play the guitar and ride an ostrich. After a decade of blondness, he is ready to move on. How do you feel now that this has ended? It’s hard to sum it up, it’s hard to sort of conjure the words to describe it. It’s been a lot of fun, obviously. A little hard work has gone into it – hard work, if you could call it that. Great relationships have been struck up certainly in the last four years. A lot of people have made friends for life. I’ve certainly been invited to a lot of weddings and so forth since the last three years… So, yeah, it’s hard to say one thing about what’s been good about it. The whole thing has been a roller coaster of emotions, really… mostly good. It’s a shame that it’s all over. Has these films influenced you greatly over the years? Yeah. Massively. I like to think that those years – 12 to 18 – you’re very influenced and very susceptible to what people are saying, certainly from adults etc. And usually those years you spend at school with your peers and so forth, they can influence you in one way and I think you end up quite different if you’re influenced by a whole different set of people, and most of those people have been adults. You spend a lot of time around all different walks of life, which I feel very grateful for, the fact that I haven’t just spent my childhood with other children of my own age in a fairly similar environment. We’ve also had the benefit of meeting, you know, electrical guys from London, and meeting producers from all over the show, from America and so forth. So really it really has brought… having the opportunity to really talk to different walks of life. Also, the musical influences, film influences, you know, the recommendations are very different from adults as they are from children so you’re watching [movies rated] 18 at 13! “It’s really hard to hate him,” adds Daniel Radcliffe, who also explained that while Grint used to be a chatterbox when they first met in Philosopher’s Stone, these days he’s not a man of many words. When TFI came to interview the actor who created some controversy by appearing in Cherrybomb (released earlier this year), a journalist that had a turn before us reported that all of her 35 questions were answered in 15 minutes. But before we could panic, we were called in. Inside, Rupert sat on an armchair. He rose to shake our had. We greeted him cheerfully because, honestly, this was the interview we had been waiting for. This immediately put him at ease. It’s true that he doesn’t rattle off 650-word answer to a question, a la Radcliffe, but our questions made him laugh. What was it like having Dan study you, to mimic you for the Seven Potters? Yeah, it was really good, actually. I know, I’m the same… I’ve got quite a complex about it now, actually. He discovered the fact that I kind of really move my hips, my pelvis, when I walk… I never was really that aware of it until he started kind of mimicking it… yeah, it’s really a… kind of Elvis kind of movement. And this time around you have a whole new Weasley, your big brother, Bill. What was it like, acquiring Domhnall Gleeson? Oh, yeah, it was brilliant. Domhnall, it’s quite an unusual name. He fitted into the family. He was great. It was surprising that we haven’t kind of met him earlier on, really. I suppose he’s been away but it was great to finally meet him. It was quite strange kind of how… to try and create that illusion of a relationship that’s like I’ve known him all my life. But he’s such a nice guy. We have a kind of chemistry, I suppose… He kind of looks like all of us, as well.